Generally speaking, it’s pretty croweded in every restaurant on Mother’s Day, so we didn’t really want to dine out. Yet my family suggested that I should have a day off from kitchen, at least not cooking for dinner as usual. Then came an idea from my daughter. She would like to bake a chicken and mushroom pie for us. My husband said it was a nice Mother’s Day present that was better than those bought from gift shops. Thus, I didn’t need to cook, yet was quite busy around in the kitchen, giving a bit of coaching to my daughter and taking photos of her cooking. When the pie came out from the oven, I couldn’t wait to taste it. The creamy fillings and the puffy pastry made me a memorable Mother’s Day. Together with pumpkin soup and garlic bread, I was so full to take any dessert. Rinse chicken and drain well, chop into chunks. Marinate for 15 minutes. Heat oil in frying-pan, cook chicken for 5 minutes, until lightly brown. Set aside. Melt butter on medium. Sauté onion, celery, carrot and green beans until soften. Add flour and cook for 1-2 minutes, stirring, to make a paste. Gradually stir in stock and cream. Bring to a boil. Reduce heat to medium-low. Cover and simmer for 5 minutes. Remove from heat. 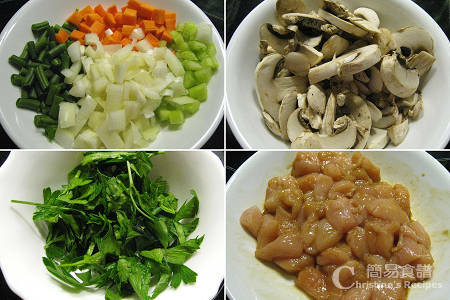 Stir through mushrooms and chicken. Season, stir in parsley. Preheat oven to 200C (392F). Roll out pastry on a floured surface. Place a 4 cup-capacity pie dish upside down on pastry. Cut around dish. Cut out leaves from excess pastry to decorate and damp with a bit of water to place onto the pastry. Cut a 1cm slit in center of lid. 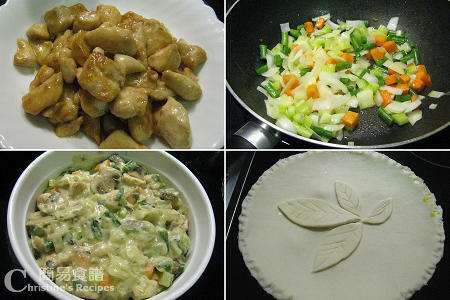 Spoon chicken mixture into pie dish. Top with pastry and crimp edges to seal. Whisk together egg and milk. Brush over pastry. Bake for 35-40 minutes, or until golden. Serve hot. Wow! 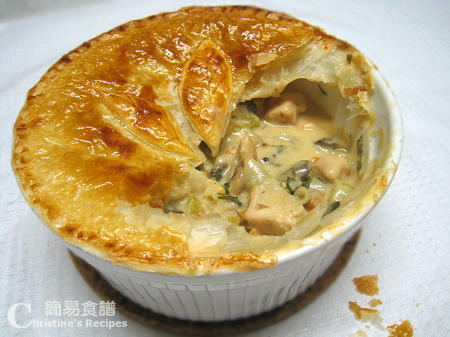 This is lovely and I love mushroom chicken pie too. Will bookmark this and make it one day! She's very sweet and creative. Love her cooking too. i LOVE LOVE your blog & your recipes. Wish I could know your name and thank you. I'll keep it up for sure. I tried this one last night, and this one is really really yummy! Thanks for leaving your comment to let me know how you like my recipes. Hi Christine.. I'm a new reader of your blog. I find your recipes are simple and easy to follow. Thank you very much for sharing. One question, can you show us a picture of the raw pastry puff? Can I get it from Coles/Woolworths? What is the brand name? Thanks again! Yes, you can get it from Coles/Woolworths. Here's the picture of puff pastry bought from supermarkets.